This page is an attempt to visually document the purchase and eventual return to it's former glory of my 1956 NSU Prima. All the small pictures are links to bigger versions of the same picture. 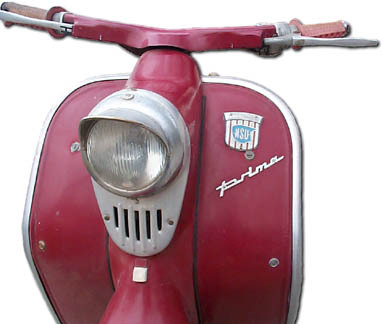 The scooter was purchased January 17th 1999 in Salt Lake City, from the second owner. He bought it from the original owner some years ago, the original owner purchased the scooter while in the military in Germany. Before the purchase I went to take a look at the scooter, it was stored in a greenhouse, it looked complete, but like it definatly hadn't seen the road in many years. After carefully loading the scooter up in a borrowed truck and hauling it home it was safely delivered to my garage. The yellow cabinet you in the picture was about half full of NOS parts, including a piston, tail light, brake liners, assorted bulbs and cables. The original owner seemed to know he's have trouble getting parts in the USA, so he stocked up. It even had the original manual and a parts book. Here's a couple of pictures of the scooter fresh off the truck. January 18th I went out to buy two new batteries, the Prima runs two 6-volt cells in series to power a 12-volt system. The batteries that were with the scooter looked like they had been frozen one time too many, and weren't even worth trying to charge. I was unable to locate to appropriate 6-volt batteries, but did find a single 12-volt battery that just barely fit. It starts. Pretty much every part of the engine was covered with a thick layer of oil soaked dust, I used an old tooth brush and lots of Simple Green, with an occasional shot of carb cleaner to start to clean it up. Here's a picture of the engine from the clean side. January 26th I dropped off the rack, crashbars and cowl trim at Salt Lake Chrome for a fresh coat of shiny. The total is to be $201 plus tax, I put $100 down. Completion time is estimated at one month. The next hurdle was none of the lights working, which I tracked down to my being dumb, and not realizing that the ignition switch rotated and has three distinct positions, no lights, parking lights, and headlight/tail light. All the lights run off of the battery. In the course of tracking this down I discovered that a small plastic barrel in the igntion was broken. The ignition looks a bit like this. And from the top, with the cover removed. The evening of Feburary 3rd I bought a Dremel tool and a plastic handled screwdriver with a plastic made handle of about the same type of plastic, and set out to carve/grind/sand a replacemnt piece from the plastic handle. It took until one in the morning, but I now have a suitable replacment piece. Here's a picture of the replacment piece, surrounded by the broken pieces and the 'key'. Feburary 6th, I re-assembled and installed the ignitions switch. I also pulled off the spare tire and started to do a bit more cleaning. I removed the rear fender, and rear wheel, to give myself a bit more working room. Feburary 8th, I took a much-needed day off and went to the DMV to file for a new title. I also spent some time in the garage and cleaned up the front wheel and forks, it was pretty dirty. Feburary 14th, got the cylindar shroud off, pretty dirty on the inside, but should shine up nicely on the outside. Feburary 15th, polished up the cylindar shroud, and cleaned up the flywheel area a bit. Everytime I remove a part, I find more dead spiders. Feburary 17th, heard from Harmut at German Parts Unlimited, they have all the parts I've inquired aobut in either N.O.S. or reproductions. All I really need is some replacement rubber parts, I'm not missing any, but some are pretty old looking. Feburary 18th, spent some time freeing up a stuck clutch cable. When I was spraying tri-flow into the cable housing and none of it made it to the other end I figured I should probablly order a new set of cables. I also put the engine shroud back on, I'm pretty happy with how it came out. Here's a night time pic with the parking light on. The parking light is actually a seperate 3 watt bulb. Feburary 21st, polished up the headlight rim a bit, it's pitted enough that I think I'm going to have it re-chromed. Feburary 23rd, heard from NSU-Motzke via email, they have all the cables, looks like they'll cost about $120.00US for a complete set, with shipping. I'm going to order and pay via wire transfer to speed things up. I wish I could read German. Also, I removed the headlight glass and reflector from thier mount, I'm going to try and get the headlight rim and visor in on my earler chroming job. Feburary 24th, dropped off the headlight rim and visor at Salt Lake Chrome, they say it should all be done in a week or two. It's going to be another $18 for those two parts. It's 60 degrees today, I'm starting to get spring fever. I scanned the original guarantee card that came with the scooter tonight. March 3rd, heard from NSU-Motzke, they have my parts, I'll be sending a wire transfer today for 717.76 Marks, a little over $400US, this is for all new cables and lots and lots of rubber parts. This includes expensive shipping, so I should have my parts in 6 or 7 days from ship date. March 8th, haven't heard anything from NSU-Motzke, I'm assuing my parts are on the way. My chrome should be done this week. March 12th, got an email from NSU-Motzke, they were on 'holiday'. My parts have shipped, I should have them in 7 days or so. March 18th, called Salt Lake Chrome to check on my parts, they said they should be done tomorrow. My parts from NSU-Motzke should be here any time now. March 19th, Salt Lake Chrome says my parts will go into the acid tank monday morning and may be done monday afternoon. March 22nd, It's like Christmas at my house, my parts arrived from NSU-Motzke and my chrome was done today. The chrome came to just under $250, with the headlight rim and visor, and a seven percent 'environmental cleanup' fee. The way the throttle works is sort of clever, the inside of the handgrip has a spiral channel in that a piece holding the end of the throttle cable fits to, so all the parts that convert from twisting motion to a pulling motion are actually inside the grip. The parts from NSU-Motzke are all good quality reproductions. I got everything I wanted except the passenger hand grip, I think the language barrier got me, because I got two left handlebar grips instead. Oops. It looks like they're actually making the parts themself, all the rubber parts have "NSU-Motzke" on the back of them. I also got a reproduction parts book, in german, and a book of what looks like service bulletins or maybe a workshop manual of some sort, but it's in german too, so I'm not sure. March 23rd, called today and got insurance, $129/year. I think it's time to start shopping around for insurance. I got the 25th off work so I can get a safety inspection and go to the DMV, Woohoo, what fun. Today I noticed that I've spent as much on this scooter as I paid for it. If you would like to leave comments on the page you may sign the guestbook. NSU-Motzke has an online catalog, but it's all in German. Responds to email in english sks@nsu-motzke.de. German Parts Unlimited no online catalog, but they respond to email in a few days. Kjetil's NSU page another Prima owner's site.